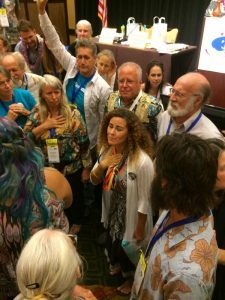 The Big Island Minute, is idea initiated by Hilo Attorney Steven Strauss at the 2016 Democratic Convention in Honolulu, Hawaii. 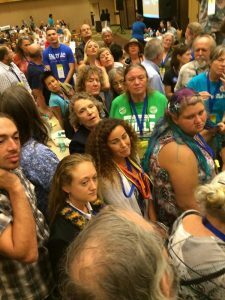 Residents of Big Island along with neighbor islanders joined us in the front of the convention. Each participant had 1 minute to speak on whatever topic he/she wanted to talk about. Senator Russell Ruderman, Councilwoman Margaret Wille, County Council Candidate Jen Ruggles, and Representative Richard Creagan were among the speakers. 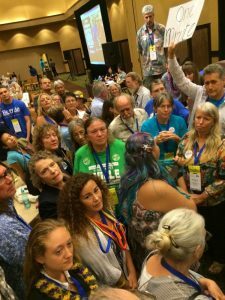 “This was a great demonstration of impromptu democracy. Everybody has a voice, everybody has a minute,” said Jen Ruggles. “This is my first convention, and like many of you, it has been an enlightening experience. These conventions shape the future of our political climate- who becomes our president and what legislation our party should pursue.